All winter long, I collect my garden wastes in plastic pails on the deck outside my kitchen door where they freeze and thaw in our south Alberta chinook climate. We generate a lot as I make vegetable juice every morning. Over the winter I fill about 12 pails full. In the fall I collect and save all our leaves and keep them in bags to stay dry. In the spring when the pails have thawed, I layer my leaves and kitchen waste in my "Earth Machines" just like all the composting brochures say. Doing it this way, I can actually collect enough at one time to start a batch big enough that it heats up! I "turn" it by using a compost aerating tool from Lee Valley Tools that you shove in and pull out and it rips holes through the compost and disturbs the layers. They're a lot easier to use than turning and it just takes a couple of minutes. As you may Know I'm from Alberta too. Those chinooks really put your compost materials through the physics of freeze thaw cycles. The usual insect shredders are hibernating but freezing does the job. 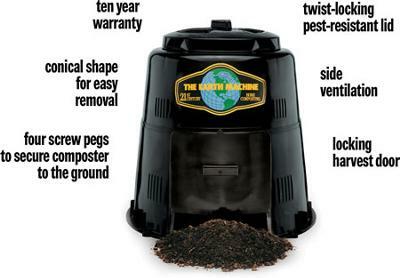 Earth Machines are one brand of composter that towns sometimes bring in. They have programs that offer bulk deals to municipalities.